Live from our studio in stunning Golden Bay, begin your day with our bubbly and energetic breakfast host Wendy. Get the latest news, weather and what's on across the top of the South Island. On today's show Wendy is joined by Monica Nelson to speak about the Long Blue Line For Climate and the Australasian attempt to create the longest banner to raise awareness of our environment. 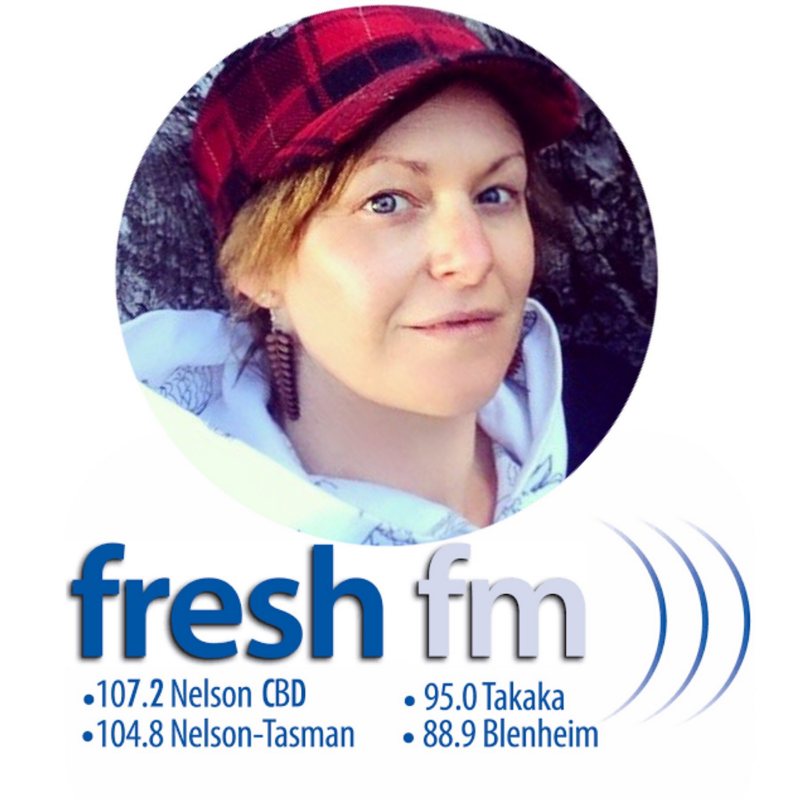 Victoria Davis is live from the Love Revolution Heart Quarters with her weekly views and opinions on what's been happening around the world and NZ during the week. Nine year old Vera Jacobsen joins us from Wanaka for a chat. President of Motueka Waka Ama Callum O'Leary speaks about the Motueka High School Waka Ama team, the only South Island team to compete at the 2019 Secondary Schools Waka Ama Nationals. Also a great mix of music to get your foot tapping as your day gets started. Coming live from our studio in Golden Bay, begin your day with Wendy. Local news, weather, what's on and a great mix of music gets your day underway. On today's show Wendy is joined by Peter Blasdale to speak about the NBS Mystery Bike Ride in Takaka. Our weekly regular Victoria Davis is live from the Love Revolution Heart Quarters with her views and opinions on whats been happening around the world and New Zealand. Folk and country musician Adam McGrath speaks about his current NZ tour and what its been like being a musician in New Zealand for over 15 years. Our show sponsor Russell from Sue's Shop is in the studio. Live from our studio in Golden Bay Wendy begins your morning with local news, weather, what's on over the weekend across the top of the south and is joined on the show today by guest co-host Sam Blanchard. Victoria Davis is live from the Love Revolution Heart Quarters. President of the Golden Bay Grey Power association Michael Delceg informs us about what they do in and around the community. International award winning musician Julia Stone of brother and sister duo Angus and Julia Stone takes us on a journey around the world as she chats to us ahead of their gig in Nelson. Begin your Friday with Wendy live from our Golden Bay studio where she starts the day with local news, weather and a great mix of music. Matt, the bassist from Christchurch band One Waka is on the show ahead of their gig at Roots Bar in Takaka. Victoria Davis is live from the Love Revolution Heart Quarters with her weekly chat. Show sponsors Sue and Russell come into the studio for their weekly chat. Wendy has what's coming up around the top of the South Island over the coming couple of weeks. Jane Dixon owner of the Mussel Inn in Golden Bay is on the show to chat about their annual Hop Harvest. Victoria Davis is live from the Love Revolution Heart Quarters. Golden Bay local Deborah Rhodes joins us to discuss women in the community and how they can come together during times of stress like the drought our communities have been facing over summer and lets us know about the get together next Tuesday. Sue and Russell our show sponsors are in for their weekly chat with us. International singer and performer Bryan Adams calls the studio for a chat while in NZ on tour. Live from our studio in Golden Bay join Wendy as she begins your day with local news and weather. Today's show is an all female music line up to celebrate International Women's Day. Each show wonderful guests give their time. This show, Ivan Rogers from Department Of Conservation in Motueka speaks about our New Zealand Whio - Blue Duck. Nelson Mayor Rachel Reese is on the show. Show sponsors Russell and Sue stop in for a chat. Victoria Davis is live from the Love Revolution Heart Quarters. Karen lets us know about the Country Music Festival weekend on in Golden Bay over the weekend and we give away a double pass. Live from Golden Bay Wendy begins your day with local news and weather. Victoria Davis is live from the Love Revolution Heart Quarters with her views and opinions on what's been happening around the world. New band from New Zealand L.A.B are coming to Nelson this weekend. Lead vocalist and guitarist Joel Shadbolt speaks on the show. Show sponsors Russell and Sue come by the studio for a chat. An awesome mix of music to get your day started. Wendy and Grant begin your Friday morning with news, weather and a mix of music. Today they speak with Wellington Motown band The Fades ahead of their gigs in the region. Carol Wells from the Golden Bay Animal Welfare Society is live in the studio to speak about what they do and how you can help. Victoria Davis is live from the Love Revolution Heart Quarters with her views and opinions on what's been happening around the world during the week. Our show sponsors Sue's Shop in Takaka come into the studio to have their weekly chat. On the show today we feature the Golden Bay A and P Show and are joined by Noel Baigent to tell us all about what we can expect. NZ and international musician DJ Freq Nasty is live with us and chats about his current NZ and Australia tour ahead of his gig at the Golden Bay music festival Ponies. Victoria Davis is live from the Love Revolution Heart Quarters with her views and opinions on what's been happening around the world this week. Our show sponsors Russell and Sue stop by the studio for an interesting chat about business mentors and a need for them in Golden Bay. National treasure and one of New Zealand's most revered musicians Paul Ubana Jones chats to Grant and Wendy as part of his NZ tour. Ann Jones who is associated with the Abbeyfield Residential Home in Golden Bay speaks about what the home is and about their open day. Victoria Davis is live from the Love Revolution Heart Quarters with her views and opinions on what's been happening around the world during the week. Our shop sponsors Russell and Sue stop by the studio for a chat about what's happening at the store this coming week. Live from our studio in Golden Bay Wendy is joined on the show today by New Zealand comedy royalty Michele A'Court. Mad Cafe in Collingwood owner Nganga speaks about the Healing Arts Festival on this weekend. Our weekly guest Victoria Davis is live from the Love Revolution Heart Quarters. Our show sponsors Sue and Russell stop in for their weekly chat. Wendy has your local news, weather and a great mix of music. Fresh Start Friday live from our studio in Golden Bay. Dennis Bush King speaks to Wendy with the latest updates from the Nelson Fires. Victoria Davis is live from the Love Revolution Heart Quarters. NZ and international musician Dub Terminator joins us on the show ahead of his gig at Tahuna Roots in Nelson.